MAGALLEONES FESTIVAL is a festival celebrating Magallanes as a beautiful, peaceful and charming place which is rich in cultural and historical heritage. 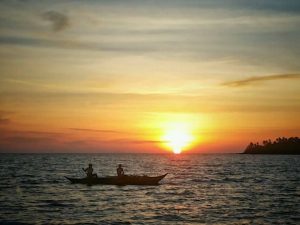 It seeks to revisit the past, the history, the struggles and the role of its people in the galleon making times of the Spanish colonial period when in the nearby Bagatao Island was regarded the biggest shipyard in the Bikol region. It was called the Royal Astillero of Bagatao where the grandest, largest, costliest, swiftest and much celebrated galleon that ever plied the Pacific during the Manila-Acapulco trade was built. 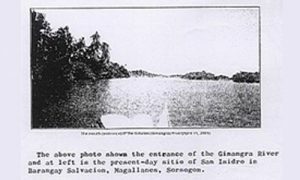 That galleon was christened “Santisima Trinidad y Senora del Buen Fin”. It also commemorates the beauty of the town of Magallanes in the times of the galleon-making frenzy when it was said and noted in history books and historical accounts that the place was then a luxuriant forest that was abundant in excellent hardwood. One of these, a specie called “parina” was highly coveted as a variety for galleon making due to its solid and tough quality. It is reputed to withstand the punitive trashing of the high seas as well as the cannon ball hits of the enemy. 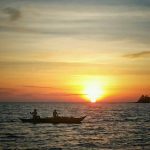 It also commemorates the introduction of the Catholic faith when the Augustinian Friar Fray Alonzo Jimenes celebrated the first Christian mass in the main island of Luzon and baptized the natives in the settlement now called Gibalon. 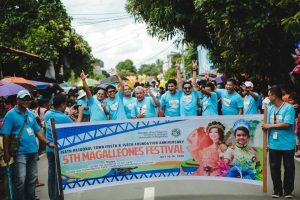 The Magalleones Festival, furthermore, honors the Patron Saint of Magallanes, “The Lady of Mount Carmel” in her 150th reign as Patroness and protector of the town and its people from all forms of harm and calamities. 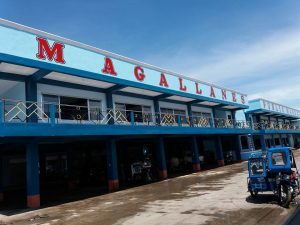 The people of Magallanes, then and now are a faithfully devoted kind, dutiful and sometimes overly religious because the Catholic faith is deeply embedded in their system. All the barangays as well as the sitios have their own patron saint or patroness which also have their own fiestas. This is a manifestation of the Magalleños enduring and indomitable faith in God. To promote religious and cultural tourism not only as an economic enabler but also as a tool for communal harmony and peace. Being the first, the Local Government Unit of Magallanes, through the leadership of Honorable Mayor Augusto Manuel M. Ragragio, fully supported by the Sangguniang Bayan, the Municipal Government Department Heads of the LGU and the people of Magallanes, the Magalleones Festival was successfully launched on July 10, 2014 through a grand parade and colorful street dances and presentations. The street dancing event of the festival was participated in by various schools, both secondary and elementary which came up with their own interpretation of the concept of the festival, complete with colorful costumes and props. The Local Government also had its own contingent of dancers together with the members of the Liga Ng Mga Barangay. The legal basis for the said festival is Municipal Special Ordinance No. 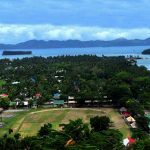 01-2014 entitled “An Ordinance Institutionalizing the Magalleones Festival in the Municipality of Magallanes, Sorsogon to be Celebrated on July 9-15 Every Year, Appropriating Funds Thereof And For Other Purposes” duly approved by the Sangguniang Panlalawigan on May 19, 2014. The Seal of the Festival was unveiled to the public after the street dancing exhibition at the Rizal Park, with the presence of the Provincial Tourism Officer of the province of Sorsogon as part of the grand opening celebration accompanied by pomp, gaiety and fireworks display in the evening. 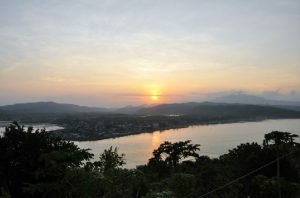 The Seal, featuring a galleon symbolizes love, unity and cooperation, the cross and the sun symbolizes the role of Christianity in the history of Magallanes where the first Christian mass in the island of Luzon was celebrated in 1569, the two light houses are the Parolang Dakula (located in Bagatao Island facing Ticao Pass) and Parolang Saday (located on the other side of Bagatao island, in Barangay Biga facing the coast of the Municipality of Castilla), the helm or the ship’s steering wheel and the anchor symbolizes the town’s role in the galleon-making and trade during the Spanish colonial period, the image of a woman symbolizes beauty, the lively colors used symbolizes gaiety and the term Magayagaya and the people in it represents the community of Magallanes working together in harmony and cooperation in propelling the municipality further towards brighter development horizons.